Height: 1 to 3 ft.
Cow parsnip looks like Queen Anne's lace on steroids. It is larger and heaver in every dimension. Queen Anne's lace has hairy stems and a central blackish blossom. 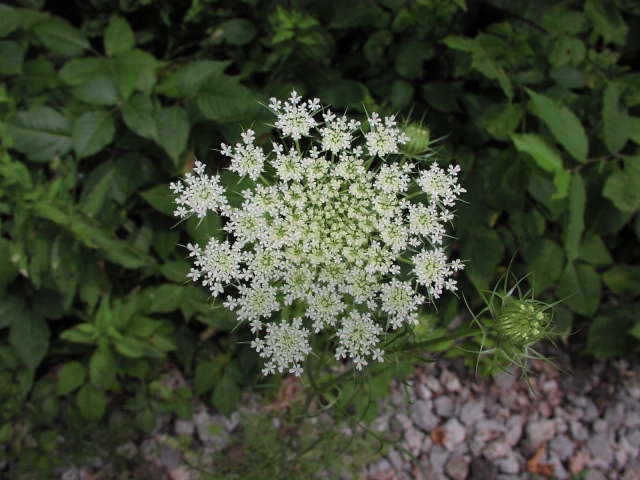 The hemlock has a smooth, thick stem, while Queen Anne's lace has a delicate, hairy stem. Queen Anne's lace has a delicate, carrot-like leaf, while cowbane has divided leave with lanceate leaflets. Wild parsnip is always yellow, while Queen Anne's lace is normally white (though rarely pink).